Today, Weinstein saw the leak of his pleading email, actress Romola Garai accused him of "humiliating" her, and Kate Winslet called him "reprehensible." Post-firing, the worst week of Harvey Weinstein’s career continues. Once The Weinstein Co.’s co-chairman took a leave of absence in response to New York Times revelations that he’d settled at least eight sexual harassment cases, on Oct. 6 TWC’s dwindling board hired outside investigator John Kiernan, a partner at Debevoise & Plimpton LLP. However, a source told Variety that Weinstein then attempted to bully his staff into hindering Kiernan’s inquiry. Two days later, Weinstein reportedly emailed entertainment CEOs soliciting same-day endorsements — sent to his private Gmail address — that he could show the board. Weinstein believed the board members would effectively “destroy the company” by terminating him, which they did within hours. 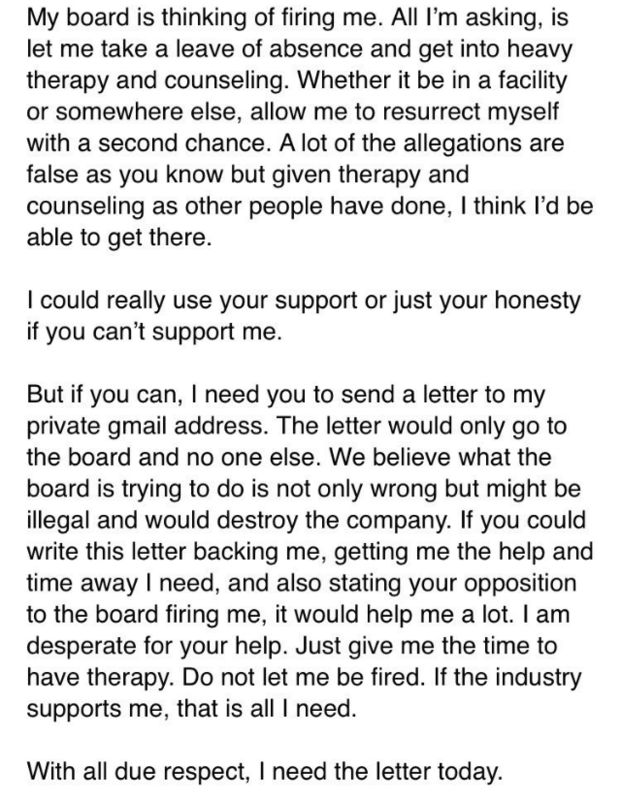 The Hollywood Reporter’s Janice Min shared this email on Twitter today, claiming Harvey Weinstein as its sender. An hour after Min posted the email — the same day both Meryl Streep and Kate Winslet called Weinstein “disgraceful” — The Guardian published an exclusive with “Atonement” co-star Romola Garai, who said she felt “violated” during an encounter with Weinstein in London around 2000. “Like every other woman in the industry, I’ve had an ‘audition’ with Harvey Weinstein, where I’d actually already had the audition but you had to be personally approved by him,” she said. “I had to go to his hotel room in the Savoy, and he answered the door in his bathrobe. I was only 18.” They discussed a film and Garai left. She eventually acted in “Dirty Dancing: Havana Nights,” a Lionsgate and Miramax co-release. “The point was that he could get a young woman to do that, that I didn’t have a choice, that it was humiliating for me and that he had the power,” she said. “It was an abuse of power.” Garai joins fellow actresses Ashley Judd and Rose McGowan, who’ve each come forward about uncomfortable hotel-room interactions with Weinstein.